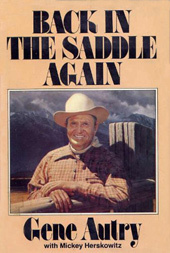 Spanning careers as a ranch hand in Oklahoma, Tin Pan Alley singer, Hollywood star, and corporate businessman, the life of Gene Autry is the embodiment of the great American dream. Through a combination of luck, timing, talent, and business savvy, Autry raised himself from dirt-poor beginnings to become a legend in the entertainment industry. Here, the original "Singing Cowboy" offers a memoir of his music, his acting, his cowboy image, and his life. 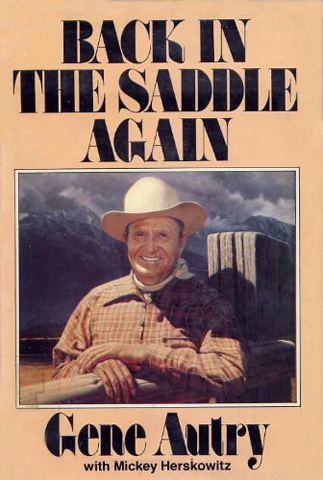 Back in the Saddle Again is an American success story filled with colorful anecdotes and observations by a man who made his dreams come true. In addition, forty-seven rare photographs, many from Gene's own collection, illustrate this fascinating story. About the co-author: Mickey Herskowitz, a syndicated sports columnist, collaborated with Howard Cosell and Dan Rather on their bestselling autobiographies and is the author of The Golden Age of Pro Football.